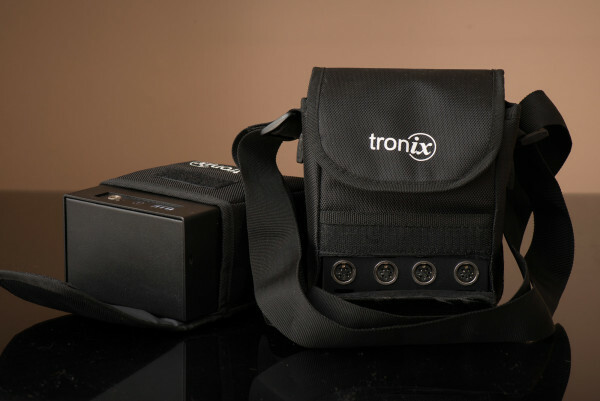 Robbert Dijkstra reviews the Tronix Explorer P-Dock, a high-performance Li-ion battery pack that powers 4 speedlites at once. There are a number of reasons why for some photographers a speedlite is a better choice than a strobe. The internal reflector of speedlites make them much more energy efficient when shooting with undiffused flash at larger distances. In that case the main advantage that a strobe has, which is power, is limited. Even with narrow beam reflectors they do not have the energy efficiency of speedlites. Other advantages that speedlites have are portability and controllability. However what remains problematic with speedlites, even with high-end ones, is recycle speed. The output that AA batteries can deliver is simply limited, meaning that 3.0 seconds cannot be further reduced without changing the energy source. There are two options that can reduce the recycle speed. The first of the two is plugging in a battery pack in the HV-port. This decreases the recycle time because the flash gets fed by additional power from a different source. The other option is to increase the number of speedlites. By opting for 2 or even 4 speedlites it is possible to fire them at respectively 1/2 or 1/4 output, meaning the recycle time will decrease accordingly as well. Both possibilities work well, but when you need additional power the situation becomes a bit more complex. External battery packs often only power a single flash, meaning that you would need to buy 4 different battery packs, remember to charge them, pack them and use them all together. I think that by now you have gotten my point. Why do you need one battery pack per flash? Can’t we just have one that powers all? This is exactly what the Innovatronix’s Tronix Explorer P-Dock does. 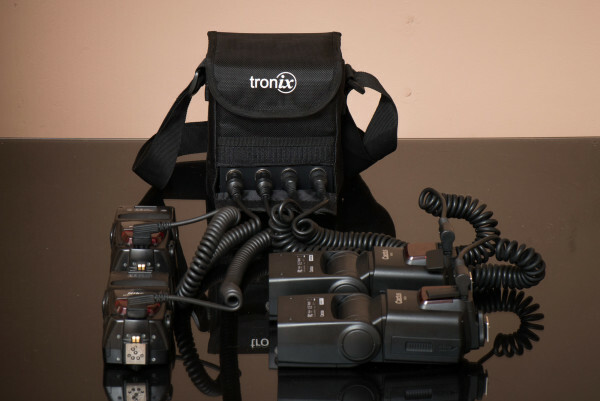 It is a battery pack that can power up to four flashes simultaneously; the only requirement is that each speedlite has a HV-port. It certainly sounds like a robust and interesting solution for a problem that not many photographers have. Personally I have been in these situations where speedlites were the better alternative compared to monoblocs and it would have been great to be able to utilize the capabilities of the P-dock. Innovatronix sent us a sample to so we could find out how useful the P-Dock would be in practice. When you unpack the P-Dock you soon notice that it is unique. 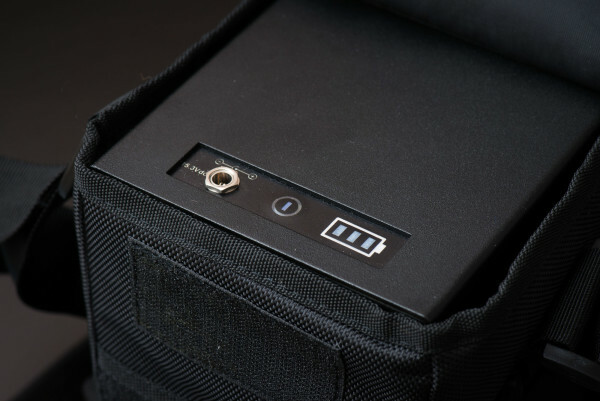 It is bigger than any other battery pack out there, which can be partly explained by the fact it features the same 91 wh 13.2 volt lithium-ion battery as the Tronix Explorer 500 Li does. This battery is meant to power two studio flashes simultaneously and seems a bit overkill to use it to power only 4 speedlites. 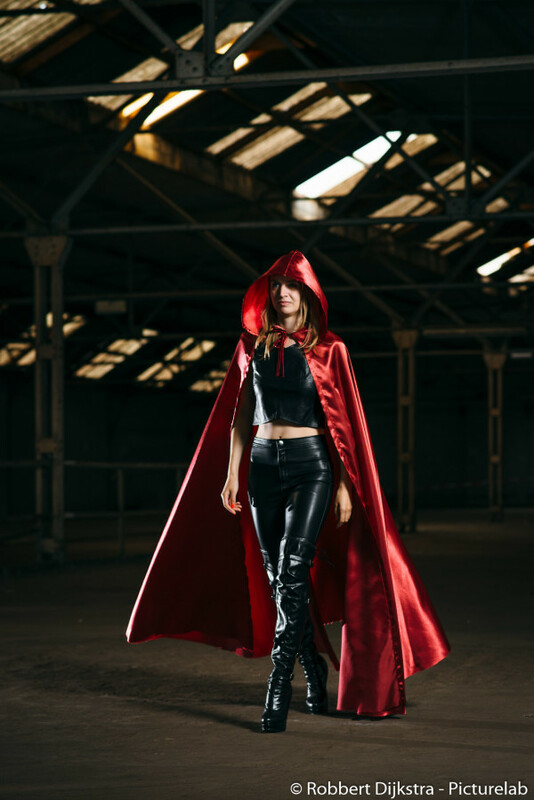 There is no risk of running out of juice with this battery either, since you are able to provide more than 3000 full power pops with a single speedlite connected (unofficial number). 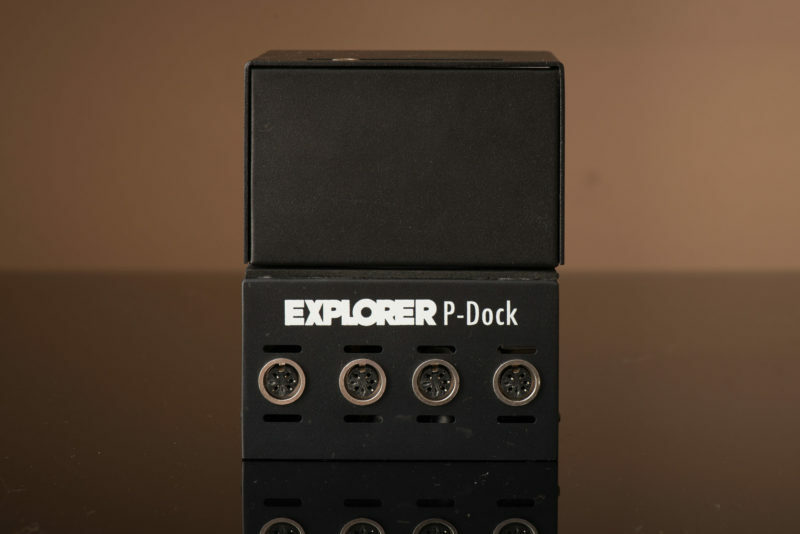 The Innovatronix P-Dock consists of two main parts. One is the battery, as already mentioned and the other is the dock itself. 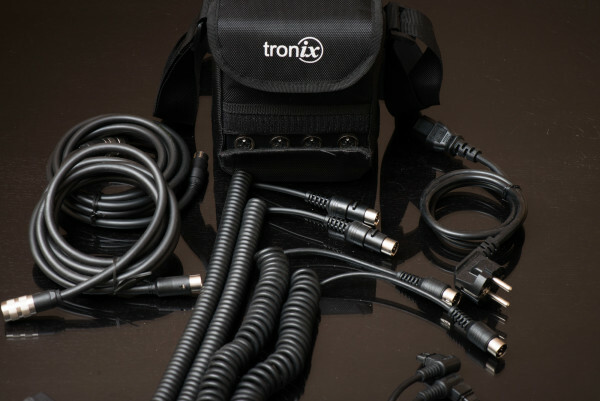 The battery is connected onto the dock and the dock have four ports in which speedlite cables can be connected. Both the dock and the battery come in their own bag when shipped. Overall first impressions are good, but not amazing. For a speedlite accessory it is heavier than I thought it would be, but most of the weight of the total 2.8 kg can be explained by the gigantic battery which weighs 1.5 kg. Build quality is good, rather solid, but it is simple. It is less refined than equipment of other manufacturers. The design of the P-Dock certainly does not show that it is a high-tech product, but I don’t mind that if the product is good. Unfortunately the P-dock is not faultless: there are a few design flaws. For instance, the battery is attached to the top of the dock, but is done so without any locking mechanism. If you want to put both the dock and battery in the bag for the dock, it is a fairly tight fit, and because of that the battery is easily disconnected when you put both in the carrying bag. Another annoyance is that when you turn on the battery it immediately switches on a fan as well. I understand that a fan is essential to prevent it from overheating when shooting in warm conditions, but I doubt it that the fan is also needed when you are charging the battery or when you are shooting in 10 degrees C. The fan is pretty loud and therefore quite annoying. Using the P-Dock is as simple as it can be. Connect the respective cable for your flash, turn on both the flash and the P-Dock, then you are able to enjoy the faster recycle times. The device is turned on by pressing a button on top of battery, which is the only button that is on the device. My review unit came with two Nikon cables, two Canon cables and two extension cables. If you want to connect multiple speedlites which are not located next to each other these extension cables are essential. 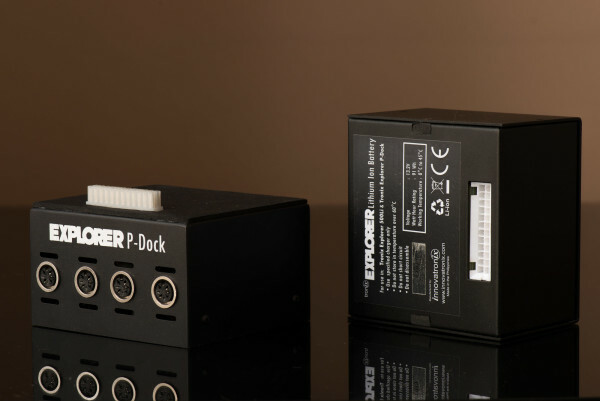 Even with several flashes attached the P-Dock is able to reduce the recycle time to approximately 0.8 seconds, depending on the exact variant of speedlite used. Battery life of the included lithium ion battery is more than great, I highly doubt that I will ever run out of juice even if I forget it to charge it between shoots. On top of the battery there is an indicator which shows how much power you still have left in the battery. I have yet to see the indicator drop below three out of three bars. It is really a great feeling that you do not have to worry about the performance of the speedlite anymore. The short recycle time and almost infinite battery life means that the typical shortcomings of speedlites are a problem of the past. During the shoots where I used the P-Dock I was less limited by my speedlites, but I was still able to enjoy the advantages speedlites offer. Because the recycle time is reduced significantly you will be able to fire more full power flashes in succession of each other, meaning that the thermal strain on the flash tube is increased as well. All this heat has to go somewhere and not all flashes can handle it equally well. For, say, the Nissin MG8000 (which is especially designed for heavy use) it will be no problem, but I’m not sure if I would use it with a SB800. In general these older flashes do not feature a thermal protection and break instead, some of them even quite quickly. Even without a battery pack attached I have already managed to fry a Nikon SB800. What is a shame in general with HV battery packs is that they still require that there are AA batteries inside the speedlites. This means that if you are shooting with four speedlites you still need to manage 16 AA batteries. The added value of the battery pack has to be found in the fact that you significantly reduce the recycle times, not that you replace the existing speedlite power source. I have to admit that initially I was a bit sceptical about how useful the P-Dock would be in practice. Although the P-Dock works well for what it was designed for, which is to power four speedlites simultaneously, it is not a convenient way to do so. The biggest disadvantages of the P-dock is the size and weight. 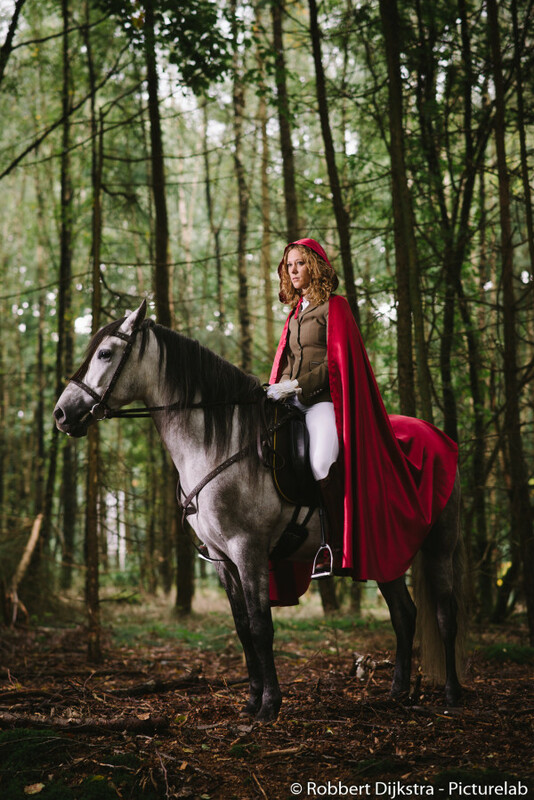 It simply does not comply with the “speedlight mentality”, which is to only bring small and light items. Furthermore, if you do not place the four speedlites together you have to use extension cables, which are annoying, as is the fan which is always turned on. However, the biggest issue for me is the price for which is being sold for. At $690 is certainly is not cheap and more than four times the price of a Godox PB960. It is not all bad. The P-dock does offer some serious performance. By connecting the speedlites to the battery pack it is almost possible to forget the limitations that speedlites have, but this is also the case with other battery packs. I certainly can think of some situations where the P-Dock would be very interesting to use. For instance, when shooting sports at larger distances with an array of multiple speedlites the battery pack would work well. If you have to shoot a high number of photos at large events the big capacity of the lithium-ion battery will be very useful. To be honest, I think that not many readers will ever be in a situation where they would need to use the P-dock. Personally I think there are better alternatives, such as the Godox PB960 for example. These type of battery packs only power two flashes at once, but are much smaller and cheaper. That said, I still think there are a number of photographers that would find the P-dock appealing and I think that these people are able to afford the premium price of the Innovatronix P-dock. Who exactly that would be you will have to tell me. For my applications the P-Dock is not the way to go. However, I still admire the innovative spirit of Innovatrix, since they have created something which is unlike anything else on the market. I am just not sure if this is the right direction to innovate. 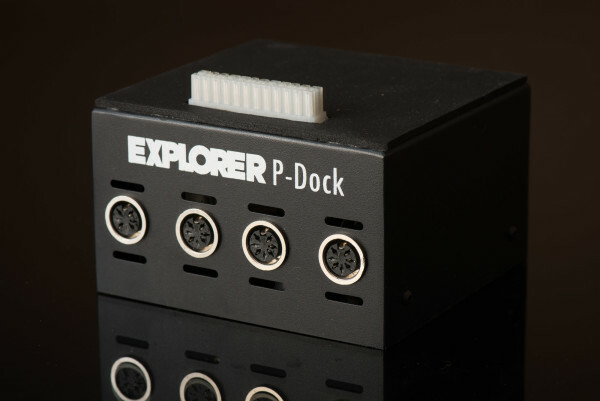 For more information on the Innovatronix Tronix Explorer P-Dock, visit the manufacturer’s web site.